Owens Corning announced Sedona Canyon as the 2017 Shingle Color of the Year. The shingle manufacturer is already known for its revolutionary TruDefinition Duration Designer Colors and now is enhancing the conversation homeowners have about their exterior remodeling. The color Sedona Canyon was selected for its warmth and resemblance to real wood. It has subtle shades that enhance the dimension of a home’s roof. Its medium and red-toned browns, butterscotch-colored hues and twists of blue-gray are versatile. The versatility of shingle colors is what makes this program exciting and relevant for the long term, according to Owens Corning. “We introduced the SHINGLE COLOR OF THE YEAR program because of how important a roof is to the beauty and value of your home,” said Sue Burkett, marketing leader at Owens Corning. “People have incorporated the latest fashion colors into their clothing, furnishings and interiors. They surround themselves with the colors that they love. Since a home’s roof represents up to 40 percent of its exterior, the selection of a color is important. Helping choose a shingle color that complements their home’s exterior, is why in addition to Shingle Color of the Year, Owens Corning joined forces with Leatrice Eiseman, global color expert and executive director of the Pantone Color Institute to pair PANTONE fashion colors with Owens Corning Duration Series shingles. “By creating an array of shingle pairings, Owens Corning is showing how shingles can work in a coordinated palette of color options for the exterior of the home,” Eiseman said. As part of this program, Owens Corning has developed a website, focused on helping the homeowner with color decisions. The “Design and Inspire” section of the website is a fresh way to think about a new roof. 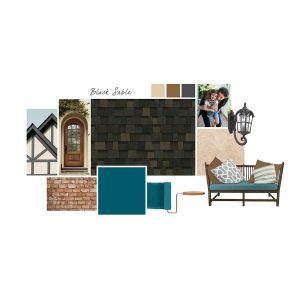 The company also will introduce additional fashion color and shingle pairings in 2017 and will announce a Shingle Color of the Year annually. All the details are at www.shinglecoloroftheyear.com. To help homeowners visualize how bold shingle colors can create a style statement that reflects the homeowner’s personality, Owens Corning offers complimentary online tools and resources. The Design EyeQ visualization tool makes it easy for homeowners to ‘try on’ a new roof by uploading a photo and experimenting with color options, effectively providing a risk-free way to experience various shingle colors. The online Roofing Color Compass Color Personality Quiz uses 10 questions to help determine a homeowner’s color personality as it fits into a shingle color choice for their home. Complementary printed color swatches of the TruDefinition Duration Designer shingles may be ordered online, allowing homeowners to experiment with shingle options before meeting with a contractor.